Alma Salon in NYC and captured on camera by the extremely talented Linda Covello. Gavin Couper , manager of the Executive Lounge–an amiable Brit imported from the Dorchester, Gavin gave a pleasant, sophisticated touch to the room. The extravagant entrance to Gilt. It was an eventful week away. All came up roses until our Avis rental car was stolen. But let’s start with the good stuff first. We flew Virgin America to JFK–our first time on this carrier. It was okay. Seats a bit cramped in main cabin (really coach) but didn’t look much better in “main cabin select” or “first class”. Had to buy food–opted for chicken wraps which were pretty good for $9 each. Anyhow it got us there on time. 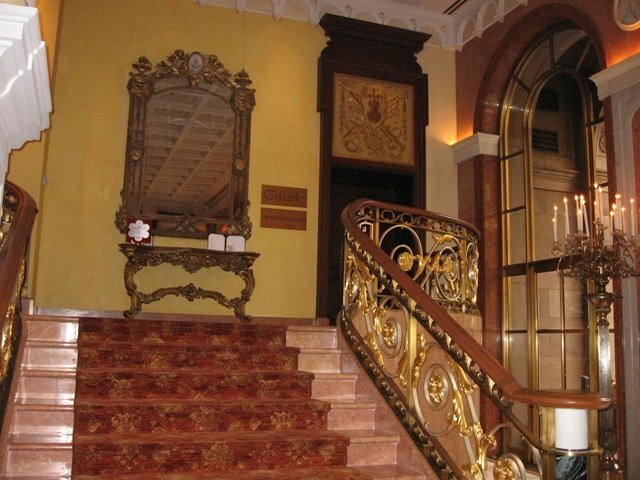 First stop the New York Palace–now operated by the prestigious Dorchester Collection, the handsome hotel sports one of the most accommodating staff’s in town (at least they treated us well), gorgeous appointments and public areas. 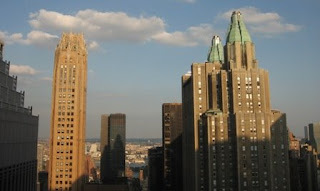 We had a massive suite on the 41st floor in the “Towers” which offers private check-in and privileges. 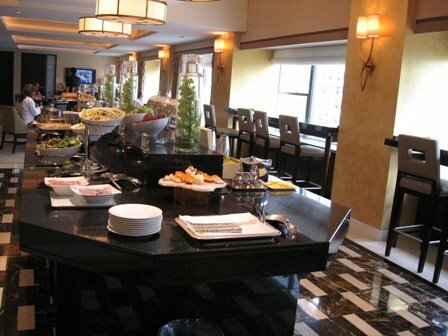 We also opted for the executive lounge add on and were thrilled we did. The suite life: huge living room WiFi, views, two baths, one big one with tub, shower, two sinks, lushes Acqua di Parma toiletries, comfy bed covered in divine, upscale linens; flat screen tvs, robes, slippers and of course hair dryer etc. . There’s a fully equipped fitness center that’s free for all and has it all including a locker room with steam bath and showers, workout clothes to borrow, toiletries and best of all it’s free for hotel guests. We needed the gym to counteract all the tasty food. But of course we got plenty of exercise walking around the city. We even did museums. We were actually in town during restaurant week and had a price fixed three course lunch at Alto, nearby for $24 each, unheard of here. We did the museums, took out Mexican one night from Chipotle nearby and even watched a Yankee game on the flat screen. 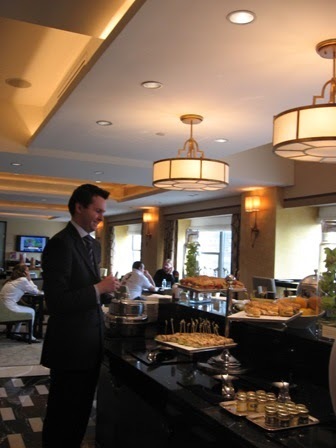 We made good use of the Executive Club Lounge–a tres elegant spot for breakfast, lunch and evening drinks and snacks. The morning spread is a real feast with everything from fresh raspberries to scrambled eggs and bacon, breads, cheeses and a whole lot more. Our yeah, I discovered I could actually order an espresso or cappuccino, so I did ’causee I could. Lunch is slightly less generous but enough with great sandwiches and salads. Evening is just a few nibbles served with wine, beer and soft drinks. Chardonnay. We dined on a truly amazing English pea ravioli–delicate and delicious, perfectly prepared halibut with poached oysters and baby veggies, Tangy Ono ceviche, moist and deliciousblack cod, authentic NY cheesecake (man it was good) and Strawberry short cake. Since we just flew in from the west coast and were guarding against jet lag we skipped coffee but I sure was jonesing for a cup. Some Gilt-toids: two Michelin star rating, housed in Landmark Villard Mansion. New American cuisine created by executive chef Justin Bogle. Gorgeous appointmentsAn 8,000 bottle wine cellar, artisanal breads, real 14 K Gold bar.